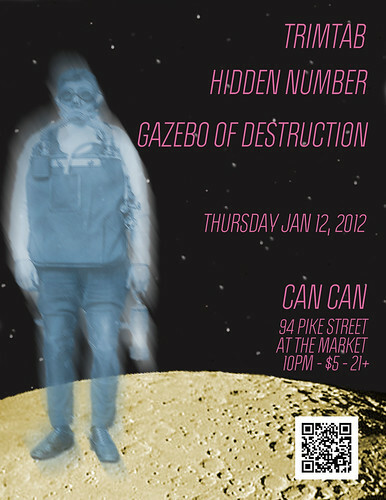 Announcing Hidden Number’s first foray into 2012! Featuring a night of intense and moody improvisation and experimentation. We will be playing a special new song, as requested by Liz Porcayo. If you think you know of the perfect song that Hidden Number should cover, do let us know. We’re also going to attempt to have some amazing visuals going on during the show, providing that there is a suitable void behind or above us. Ladies and Gentlemen, the year of 2011 was epic. We enjoyed seeing you on tour, and in our below surface level lounge. We reveled in giving you some new recordings and videos. We hope you are as delighted as we are, and we hope to mingle with you again soon. Stay tuned for the next show on Feb 1. As always, you can get all your mobile information from http://mobile.hiddennumberportal.com, or scan the code in the flyer using your time folding device. Hidden Number is pleased to announce our upcoming performance at the illustrious Can Can, located in the heart of Pike Place Market! This establishment is well known for fantastic burlesque and variety performances–but we now have the wonderful opportunity to experience live rock music in this historic venue. We do hope that you will be attending. As always, you can get all the info on your mobile device at http://mobile.hiddennumberportal.com. Are you as titilated as we are? Ask us at the show to send you some free music.